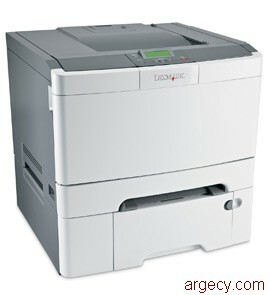 Looking for Lexmark C546 Parts? The C546dtn is compact, network-ready and loaded with benefits for small to midsize workgroups. Reap the productivity advantages of 25 ppm printing in both color and black, 256MB RAM, an optional 550-sheet drawer to load up to 1,450 sheets, paper-saving duplex printing and economical extra-high-yield cartridges. Studies show that color can significantly increase brand recognition and reader retention. Lexmark gives you 1200 x 1200 dpi color for vivid accuracy to the finest details plus tools to effectively manage color output costs. For as long as you own your C546dtn, Lexmark guarantees never to increase the U.S. toner cartridge price on Lexmark.com. Saving resources means everyone wins - your business, your budget and the environment. Print greener with paper-saving duplex, Eco-Mode, and an energy-saving instant warm-up fuser. And toner cartridges for Lexmark C540 Series printers never require shaking to deliver their full declared yield. Size (in. - H x W x D) 16.6 x 16.7 x 16.4 in. Packaged Size (in. - H x W x D) 24.6 x 24.0 x 20.5 in. Packaged Weight (lb.) 65 lb.